CLEMSON â" The numbers for Florida Stateâs defense are staggering through three games. But Clemson will be confronting football players, not statistical figures, when the Tigers face the Seminoles on the road at 8 Saturday night on ABC. The 10th-ranked Tigers (3-0, 0-0) have beaten Florida State two of the past three times, but they will face a different proposition this time from the fourth-ranked Seminoles. Florida State has put up big offensive numbers, but it is the defense thatâs garnering worthy attention. The Seminoles (3-0, 1-0) have allowed their opponents a total of three points, holding Murray State, Savannah State and Wake Forest to an average of 1.9 yards per play. Jimbo Fisherâs defense is ranked first in the country in total defense and is limiting opponents to just over six first downs per contest. The Seminoles have only played red-zone defense three times this season, and theyâre opponents have rushed the ball 85 times for a total of 101 yards. There might not be much to glean from Florida Stateâs wipeouts of Football Championship Series teams like Murray State and Savannah State. But the 52-0 blitz of Wake Forest last week certainly was an eye-opener. The Deacons had beaten Florida State four of the previous six times they played, and were coming into the game with a solid ACC win against North Carolina. The Seminoles piled up more than 600 yards of offense, but just as importantly they held Wake Forest to just 126 total yards. Florida Stateâs defense didnât produce a turnover; the Seminoles stopped Wake Forest consistently and relentlessly, forcing punts on 13 of the Deaconsâ 15 drives. The Seminoles stoppers present a serious challenge to Clemsonâs offensive line, one increased by having to face Florida State on its noisy home turf at Doak Campbell Stadium. Clemsonâs offensive line general, senior center Dalton Freeman, thinks the season-opening experience of playing Auburn at the raucous Georgia Dome will help the Tiger blockers Saturday. âIâm hoping it gave our guys some confidence, because we were able to go in and play in a tough environment and we showed a lot of poise, and weâve had two games experience since that,â he said. The Seminoles put Wake Forest in a stranglehold quickly. Itâll be critical for Clemson to avoid falling behind early, allowing Florida State to build a lead and the Seminolesâ home crowd to feed the frenzy. âThatâs gonna be our mentality, to go out there swinging and hopefully put some points on the board early and get in a rhythm,â said Freeman. The Tigers have been using some of the usual preparation tactics to try to simulate Florida Stateâs home environs, especially blasting Florida Stateâs infamous war chant that blares often and early at Doak Campbell. Even if the game was played inside a library, Florida Stateâs defense would be a formidable proposition. The Seminoles lost All-American defensive end Brandon Jenkins for the year with a foot injury, but such is the depth that his absence has hardly been noticed. Bjoern Werner, the other bookend on the defensive line, already has six sacks. The Seminolesâ secondary also is stacked with future professional football players, namely lock-down cornerback Xavier Rhodes. The Tigers expect Florida State to press Clemsonâs talented pass-catchers on the line of scrimmage, a tactic that so far has completely stifled opposing offenses. Last week, Florida State held Wake Forestâs leading receiver Michael Campanaro to two catches for 8 yards. He came into the game with 22 catches in two games, but he was clamped down by the defensive backs. As daunting a task as facing the Seminoles on their home field is, the Tigers remember the success they had last year against Florida State. Junior quarterback Tajh Boyd helped Clemson post 443 yards in the 35-30 win, as did sophomore wide receiver Sammy Watkins, who shredded the Seminolesâ secondary for 141 yards and two touchdowns. Keeping that success in mind will be important for the Tigers even as word of how great Florida State is swirls about. âTheyâre probably the best defense Iâve seen on film since Iâve been here at Clemson,â said Freeman. Florida Stateâs vaunted defense playing at home helped establish Clemson as a two-touchdown underdog. That was no surprise to Swinney. âI know weâre a big underdog going down there, but I donât know anybody outside of (Louisiana State) and Alabama that wouldnât be,â he said Tuesday. âESPN Gamedayâ will be camped out in Tallahassee, Fla., ramping up the hype surrounding the ACCâs ninth matchup of top-10 teams. Whether Clemson can prevent Florida Stateâs defense from strangling an opponentâs offense for the first time this season will go a long way in determining what kind of highlights the ESPN crew is showing after Saturday nightâs game. Missouri Tigers quarterback James Franklin will once again be a game-time decision this week, according to Missouri coach Gary Pinkel, as the Tigers resume SEC play by traveling to the No. 7 South Carolina Gamecocks on Saturday. Franklin was a game-time decision last week in the Tigers' home game against Arizona State, following a re-injury to his shoulder against Georgia two weeks ago. After throwing for 269 yards against the Bulldogs, his ailing shoulder, which required surgery over the offseason, kept him out against the Sun Devils. Missouri will prepare freshman Corbin Berkstresser for another start, after he led the Tigers to a 24-20 win by throwing for 198 yards on 21-of-41 passing. Franklin has thrown for 400 yards and three touchdowns this season, with the junior tallying career totals of 3,371 yards and 25 touchdowns. 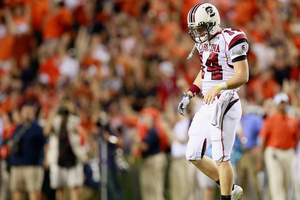 By now you know that the South Carolina Gamecocks won the game against the visiting UAB Blazers. The score looks good, 49-6, but at times it was tough for USC for some reason. One thing is certain, the Gamecocks can not come out slow to start a game in any of the remaining contests. USC nowÂ begins a seven game SEC stretch that will require them to play complete football and will determine their goals for 2012. 1. USC's Defense is stout - Going into the season, there were some question marks but go ahead and erase those from your mind. This defense is nasty especially upfront. Yes, the secondary could get a little bitter but I never said they are perfect. They are stout and USC can be in any game because of them. When you have the defense forcing turnovers, forcing three-and-outs and scoring points...well, it is a boost for the offense. 2. Clowney and Taylor are the Best DE combo in college football - USC fans need to count their blessings as Devin Taylor and Jadeveon Clowney are special talent. Having both of them strikes fear in the hearts of opposing offenses. They both have had a excellent start to the 2012 season as both are very disruptive. 3. USC special teams must improve - The Gamecocks really need the special teams unit to improve going forward. There is good talent in place, they just need to execute in their roles. The punter should be consistent, the coverage units need to tackle and the team must make field goals no matter the situation. Yes, the kickoffs in the endzone are a big plus and great to do given rule changes in 2012. Also the punt return game is improving but still needs to make a difference in a positive manner in the future as a overall special teams unit. 4. Lattimore is 100% - Don't let anyone tell you different. He had some great runs that had both power and great cuts. He is back and also seems a little quicker in 2012. The Gamecocks will return to SEC play next SaturdayÂ as they hostÂ Missouri. Kickoff is set for 3:30 ET and the game will be televised on CBS. South Carolina hasnât allowed a team to score a touchdown in the red zone and is ranked seventh in the nation, allowing 10 points a game. Ward had plenty of talent left over from last seasonâs defense under Ellis Johnson that was ranked third in the nation, allowing just 268 yards a game. Ward, who took over when Johnson became coach at Southern Miss, has his defense giving up 316 yards a contest so far in 2012, but it also has made more big plays, collecting 14 sacks and forcing seven turnovers. âWe want to be able to create plays for our offense, whether thatâs causing a turnover or putting them in great field position,â Ward said after South Carolinaâs 49-6 win over Alabama-Birmingham on Saturday. South Carolinaâs stout defense has taken a load off of head coach Steve Spurrier, who has plenty to worry about on the offensive side of the ball. Starting quarterback Connor Shaw has been knocked out of two of three games with a hairline fracture on his throwing shoulder. Spurrier said the team will have to wait and see if Shaw can start next Saturday against Missouri. Spurrier is also worried about his offensive line, even though his team is running for 172 yards a game. âWeâre always looking at it. Weâve got maybe two to three guys that we know are going to start, but thereâs maybe a couple in there we need to look and see if someone can do better,â Spurrier said. Spurrier these days doesnât mind leaning on his defense when he needs to. âItâs pretty fun. Youâre in go mode and youâre after the quarterback. And thatâs one of the things I like to do, make sacks on the quarterback,â said Clowney, who had two sacks and two additional tackles for loss against UAB. The rabbit package also impressed UAB coach Garrick McGee on Saturday night. The pressure then allows the Gamecocks secondary to make plays, too. Cornerback Jimmy Legree had a 34-yard interception return for a touchdown against East Carolina, and free safety D.J. Swearinger returned a fumble 65 yards for a TD against the Blazers. Perhaps the proudest accomplishment for South Carolinaâs defense is no one has scored a touchdown after getting inside the 20 against them. Vanderbiltâs only touchdown came on a 78 yard pass, East Carolinaâs lone TD was a 34-yard pass and UAB never got in the end zone at all. The Gamecocks are one of four Football Bowl Division teams that havenât allowed a red zone touchdown this season. When Ward watches film, he expects to see every playerâs helmet on the screen if the ball is moving forward when the offensive player is tackled. The players also responded to his more aggressive style. During drills where balls are fired at them to practice interceptions, anyone who drops a pick has to do 15 push-ups, Swearinger said.